hierba de ala, L. Inula helenium, Ar. rasīn, Fr. grande aunée or aunée officinale, MEng elena campana, Eng. elecampane inula, Helen-flower, sneezewort. It is fabled that the name of this hardy perennial composite legume, with large clusters of yellow flowers, is symbolic of Helen of Troy’s tears. This species is a native of central Asia. The Arabs cultivated elecampane in Sevillan gardens. During the Middle Ages it was very popular. The English made a dish of boiled and ground elecampane roots mixed with eggs. 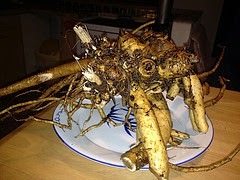 The roots were removed from the plant in autumn, when it was two or three years old and after the flowers and stems were candied. The roots, flowers and stems were sold candied in English and Spanish apothecary shops to help digestion and relieve asthma. Laguna called it “Saracen mint” for its appearance but it has no aroma. It was said that this plant was so bitter that it made anyone forget personal anguish or distress to the point that it caused mirth. It was believed that it conserved the beauty of the body and it aroused genital virtue. It was used in syrups and infusions. Most of the plant was used medicinally for the resin, pectin and oil content to abate pain. Put elecampane roots in boiling water. Leave it into soft enough to mash. Grind it well in a mortar or food processor. Put it in a pot and mix it with eggs, saffron mashed and diluted with a little raw egg and salt. Do not let it boil. When the eggs are set, sprinkle with duke’s powder and serve. Take elena campana and see< font-family: Helvetica; font-size: 10.5pt; mso-bidi-font-weight: normal;">þ it in water. Take it vp and grynde it wel in a morter. Temper it vp with ayren, safroun, and salt, and do it ouer the fire, and lat it not boile; cast above powdour douce and serue it forth. 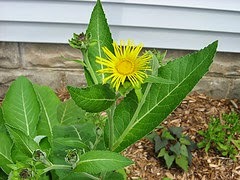 Take elecampane and boil it in water. Take it out and grind it well in a mortar. Mix it with eggs, saffron, and salt, and do it over the fire, and et it not boil. Sprinkle with duke’s powder and serve it. This recipe was not tried due to the impossibility of finding elecampane roots.